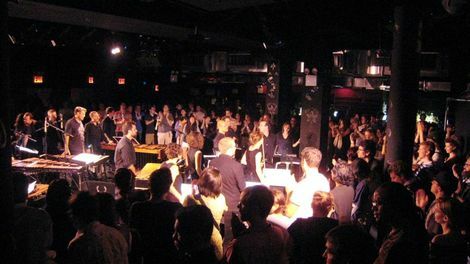 Signal Ensemble is the latest and largest assemblage of youngish NYC new music all-stars, a team-up band featuring the entirety of So Percussion alongside players from Alarm Will Sound, Gutbucket, and various other avant-classical groups -- basically a kind of Legion of Superheroes for the Bang on a Can crowd. 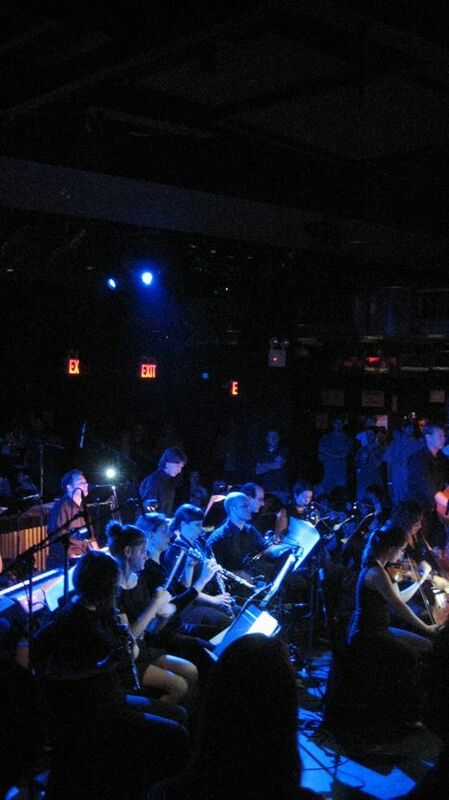 Signal in fact made their official debut at this year's Bang On A Can Marathon, and last Saturday was their first NYC solo show, in the new home for the Wordless Music series, Le Poisson Rouge. In case you are keeping track, this is a major new American chamber orchestra whose initial New York appearances have taken place in a shopping center and a nightclub. Signal are, so far, heavily invested in performing the music of Steve Reich -- they did his "Daniel" Variations at the Marathon, a whole mess of Reich rep out west at the Ojai Festival, and on Saturday and Sunday at LPR, they paired a recent piece, You Are (Variations), with the work pretty much everyone considers to be Reich's masterpiece, 1976's Music for 18 Musicians. Chances are that if you know only one piece of classical music written by a living American composer, this is the one you know. I would hazard a guess that most of the musicians in Signal grew up listening to Music for 18 Musicians in pretty heavy rotation. Some of them would probably not even be classical musicians today had they not encountered that piece during their formative years. But the thing about Music for 18 is, it requires a completely different skill set than the the one music most classical musicians train so very hard to develop. There's no conductor, for starters, which is unusual for a piece with this many players involved, and especially for one that requires such intricate rhythmic coordination. There are a ton of open-ended repeats, so it's on the players to decide when it's time to cue the next section. There are phrases whose length depends on how long the musicians can sustain a single breath. But the thing that makes Music for 18 unlike the overwhelming majority of the classical music that came before it is that the overall aesthetic effect depends almost entirely on the musicians' understanding of and command over the emotional consequences of nuanced rhythmic placement in relationship to a steady pulse. Another way of saying the same thing is that the players need to know how to groove for the piece to sound good. The parts in Music for 18 are written in such a way that everyone in the group is required to take personal responsibility for the time. Not just for their own internal time feel -- which has to be unyieldingly solid and precise, but also relaxed, unforced -- but also, their ears have to be open to the aggregate of everyone else's time feel. The players need to stay constantly focused and engaged in what is effectively an hour-long conversation amongst themselves about where the time currently is and where it ought to be. Anyway, sustaining an ongoing conversation about the time isn't something that most classical musicians are even aware they might need to do at some point -- especially not in the context of maintaining a collectively locked-in, stable, trancelike pulse. But it's different for the players in Signal -- for most of them, Reich's music wasn't something new and alien and suspiciously un-classical, involving a whole set of heretofore unfamiliar skills they needed to sweat and toil to acquire. Music for 18 was already an established part of the classical music landscape back when they were first getting comfortable with their instruments. These are players who must have known from the beginning that if they ever wanted to play that kind of music, well then obviously they would have to get their groove together. Signal has their groove together, without question. The results are inspiring, often breathtaking -- the vibraphone fanfares that herald each new section were so deep in the pocket, so right, that they made me giddy. It's undeniable that this is how Steve Reich's music was always meant to be played. It's exciting be in a time and a place where so many young classical players have become fully engaged with the art of the groove. 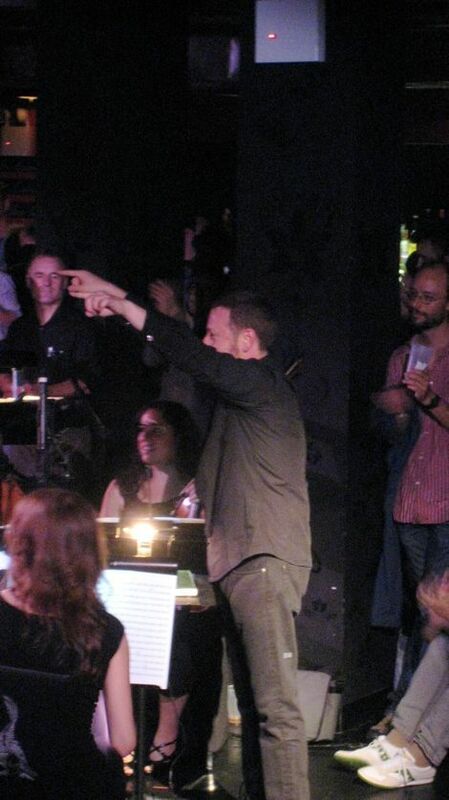 The opening work, You Are (Varitations), was performed under the direction of Signal padrone Brad Lubman, who worked the air with big gestures and Jet Li-like precision, totally unfazed by the occasional audience member bearing drinks squeezing past right behind him. Reich has said that You Are is a bit of an intentional throwback to his earlier works, but I actually don't hear it that way. Unlike Music for 18, You Are is dense with time-signature shifts, and harmonically it really stretches the boundaries of Reich's usual pan-modalism, with lots of crunchy, tightly-packed sonorities, and even the occasional burst of implied polytonality. It doesn't have the epic sweep and hypnotic warmth of the earlier work, but Reich's interlocking rhythmic structures have recently become much more intricate and complex without sacrificing their immediacy. It's clear that despite what some of his critics have alleged, Reich hasn't been spinning his wheels. Even when he's (in his own words) "not trying to consciously do something new," the results are quite distinct from his earlier output. 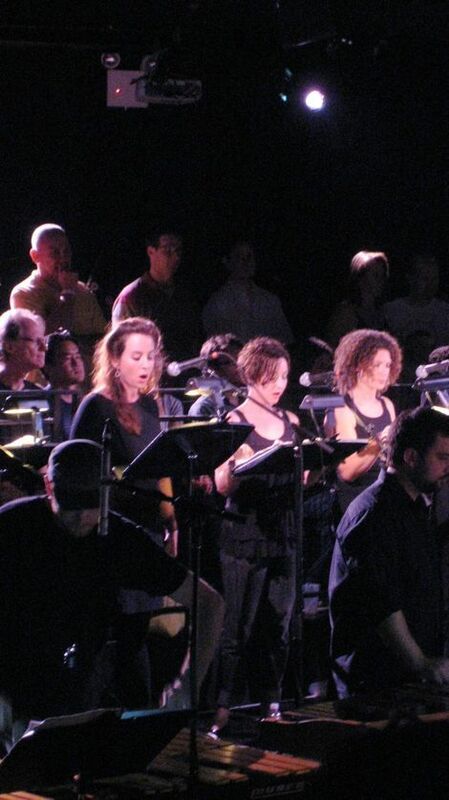 Melissa Hughes is one of the singers in Signal. She has posted an inside look at this gig on her blog. You should read it. 1. Warning: Signal's website is absurdly difficult to navigate due to some pretentious web designer's notion that scroll bars are, like, Diabolus in Folio or something. Very exciting coverage. And as usual, you have to go to the blogs to read about this stuff. "...unlike the overwhelming majority of the classical music that came before it is that the overall aesthetic effect depends almost entirely on the musicians' understanding of and command over the emotional consequences of nuanced rhythmic placement." But I don't agree with that statement. Beethoven's 7th symphony came immediately to mind. Don't you think classical musicians are concerned with rhythmic placement (and have developed this technique) as much or as little as any other musician in any other genre? I spent this morning reading through notes in an addition of Louis Moreau Gottschalk's piano music by its editor (who is also a well known interpreter of Gottschalk's work) and over and over again there is an emphasis on attention to rhythm and accents as well as this music's unusual colors and (for its time - early to mid 1800s) points of inspiration (ie African, Caribbean, and South American music). Anyone who is a fan of Osvaldo Golijov's compositions (to name one contemporary composer) would love Gottschalk. For those who don't play or maybe don't personally know musicians across the board (ie Classical, jazz, rock), I think its important or at least relevant to point out that time, rhythmic placement, and/or "groove" is a vital component to playing and interpreting much concert hall music composed before 1900. But you are making some great points here. Taking a look at what contemporary "conservatory" training is these days is important. The evolution of instrumental technique is always happening and something that should be acknowledged. Don't you think classical musicians are concerned with rhythmic placement (and have developed this technique) as much or as little as any other musician in any other genre? If you are talking about the nuances of a fluid, expressive, constantly expanding-and-contracting rubato, then yes, of course, classical musicians have a very refined and sophisticated sense of rhythmic placement. If you are talking about playing complex rhythms with a high degree of accuracy, then the subset of classical musicians who specialize in new music will generally try to make that a priority. But if you are talking about having the kind of full-body emotional connection to rhythm that allows you to manipulate your relationship to a regular pulse -- playing on top without rushing, playing down the middle, playing behind without slowing down -- and feeling how all of those various nuances of placement affect the groove... then no, that is not something classical musicians generally devote a lot of their time to working on. This is because the vast majority of the standard repertoire -- from the end of the Baroque era up until you get to Bartók and Stravinsky -- does not prioritize a steady pulse. "This is because the vast majority of the standard repertoire -- from the end of the Baroque era up until you get to Bartók and Stravinsky -- does not prioritize a steady pulse." But do you get all of the above from first knowing first how to prioritize a steady pulse? That is, how can you play rubato if you can't play on top of the beat? And isn't Les Noces based on a steady pulse? But I absolutely agree that Reich's music and many other composers have demanded an evolution of technique from the people who play it. how can you play rubato if you can't play on top of the beat? That's an excellent question, and one I wish more mainstream classical musicians would ask themselves. DIdn't I just say "up until you get to Bartók and Stravinsky"? "DIdn't I just say "up until you get to Bartók and Stravinsky"? Well, what about Beethoven's 7th? Or Mozart? Or Louis Moreau Gottschalk? Perhaps I'm making a leap by saying that in order to play this Classical stuff "correctly" you have to have the very technique that you (if I'm following this) find missing in classical players who don't play any music past Bartok and Stravinsky. Based on my own experiences as a composers, I just don't think there's as big a leap happening with the performance technique as you do. But big deal. It's certainly doesn't hurt to discuss and debate this subject. "In order to achieve accomplished performances of Gottschalk's compositions, it is absolutely essential to follow closely all the dynamics, all the accents, staccatos and stactissimos; the rhythmical patterns as well must be performed with utmost accuracy and clarify, as Gottschalk himself emphasized to performers of his music..."
And I wonder - him being a composer who grew up hearing music from Congo Square in New Orleans and as someone who traveled to and performed in Cuba, other parts of South America and the Caribbean - if Gottschalk's approach to rhythm had the "nuance" you speak of in your initial post about 18 Musicians. Actually, I am sure he had a very sophisticated relationship with time, rhythm and "feel." "Feel" is something he certainly heard and was able to transcribe and bring into his own compositions. So what did he tell people performing his music? That's something I want to research. Did he feel notation suffice? Well, what about Beethoven's 7th? Or Mozart? In most circles, it would generally be considered vulgar and perverse to perform Beethoven or Mozart with an unyieldingly steady pulse. Some degree of expressive rubato is part of the performance practice of that music. I'm not saying that performances of Beethoven and Mozart don't benefit from a little injection of rhythmic authority from time to time. They just don't depend on it. There are lots of perfectly lovely interpretations of Beethoven and Mozart by musicians who couldn't keep a steady beat if you held a gun to their head. Excellent post, sir. If you're curious, my own layman's take on the evening is linked from my name. Great writeup, Michael. The "Pulses" section that opens and closes the piece is also the most difficult bit to play. You and I saw different performances -- on the night I went, the opening was solid but there was some audible uncertainty near the end. But that's the danger of really nailing this stuff, it makes the slightest scuffle over the time instantly audible. I agree with Melissa that the group needs to tour -- they are already so killing, it's scary to think where they'd be at after a little road-seasoning. "In most circles, it would generally be considered vulgar and perverse to perform Beethoven or Mozart with an unyieldingly steady pulse. Some degree of expressive rubato is part of the performance practice of that music." Right - but what I'm saying is that you don't get to expressive rubato without first being able to play a steady beat. And in my experience this is not an alien concept to classical musicians. That is a statement that a lot of classical musicians (especially older ones) embrace in theory, but in practice it's often just lip service. And it's very difficult to internalize the fundamentals of groove when none of the music you play on a regular basis requires it. I would love to read your thoughts on the nature of "groove." What constitutes it? It's not just everybody hitting at the same time, is it? How do you make groove happen? Are there great musicians who do not groove? If so, how can they be great? Etc. Well, obviously it's all kind of mysterious and ineffable in a "you'll know it when you hear it" kind of way, but basically I think it boils down to the creative friction between pulse and placement. If you listen closely to a lot of the really badass, hard-swinging jazz rhythm sections, you'll hear that the drummer and the bass player have different ideas about placement -- they are putting their quarter notes on different parts of the beat. 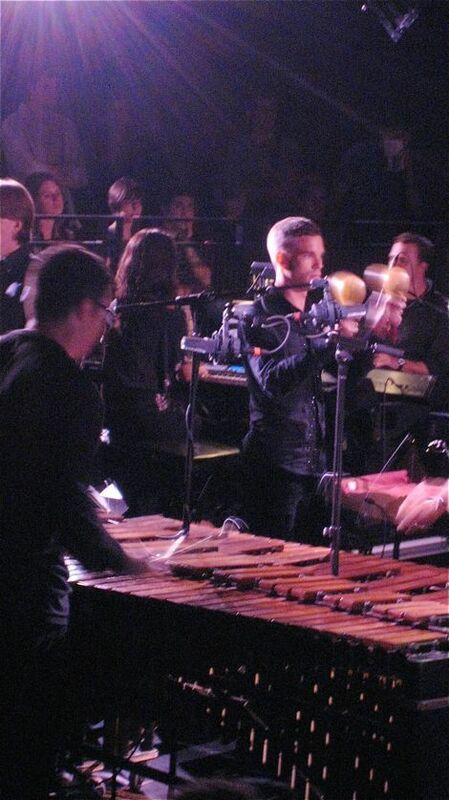 But it's clear they agree where the beat actually is, even if neither of them are playing exactly in the middle of it. If they get too far apart, it's a mess, but if they get too close together it becomes stiff and unswinging. There is a certain sweet spot where the rhythms are rubbing up against each other in just the right way. Are there great musicians who do not groove? Sure: Alfred Brendel. Lennie Tristano. Bob Dylan. (Dylan's time feel is fascinating, but it has nothing to do with groove as we usually understand it. His backing bands usually groove, of course.) Leonard Cohen. I love the Velvet Underground, but I don't think anyone would argue that they were an especially hard-grooving band. If the Velvets' "What Goes On" doesn't groove, I myself would have no idea what the word "groove" means. De gustibus etc. "What Goes On" is a great cut, with many awesome qualities to recommend it, but IMO a tight groove is not really among them. Not to continue this tangent too far, but I'd nominate "I'm Waiting for the Man" and "Venus in Furs" for great grooves. They don't groove in the lithe way that, say Booker T and the MG's grooved, but they surely subdivide the time and propel the rest of the music in unique, ineffable ways. The other question is, define swing. That one seems to flabbergast everybody. they surely subdivide the time and propel the rest of the music in unique, ineffable ways. Whether you call the Velvets' particular rhythmic idiosyncrasies "groove" or something else is up to you. I don't mean to imply that they were rhythmically unsophisticated -- quite the opposite. But their idea of playing a "Booker T." jam is almost absurdly removed from what an an actual Booker T. jam sounds like. Which is part of what I like about them. Yeah, we're definitely running into a semantic issue over what groove is, which is what I originally wanted to nail down. So your sense of groove is a specific form of "rhythmic idiosyncracy"? Interesting that Chris brings up Gottschalk. While I love his music, Philip Martin seems to lack the sense of groove Gottschalk needs (at least in the record I have). "Souvenir de Porto Rico" is drowned in rubato instead of percolating along with the clave it deserves. I don't have the chops to play much of Gottschalk's music but just reading through the scores I'm surprised at how much opportunity for groove is lying within that music. Ryshpan - Amiram Rigai is the editor I quoted regarding Gottschalk. I haven't heard Rigai's recordings of Gottschalk's music, but I really want to...I'm guessing his playing is interpretation of the piano music is very different than Philip Martin's. The piano recording I have is on Naxos with Cecile Licad playing. Bamboula in on there and I think she does a great job with it. And I completely agree - the opportunity for groove is in Gottschalk's music - and this is a mid to late nineteenth century composer. A contemporary of Chopin, right?